Also feel free to check webiste of our record label Rhythm Bomb Records where you can buy all ours RBR releases! Mississippi Queen - Oh yeah! New album is out! This new long awaited album is definitely a turnover in the band's sound and music style. The drums are now part of the groove, plenty of rocking tunes. After hearing the songs, nobody will mistake us for a country band no more. All of the songs, with an exception of Knock Knock Rattle are originals, and already gained attention while being played on the shows during last few years. Bop Train, Old Black Busted Guitar, Everybody Have A Ball, just to name a few. The title song Oh Yeah was previously included on several compilations as well, turning into a massive club hit before even released on the album. Enjoy this new Mississippi Queen album release, catch us somewhere around in your area, and let's rock and roll together! Oh Yeah! Promo Tour - February 2016.! We are playing on Moscenice Art Festival(CRO) on 05.08.2016. Rockin' Boppin' Christmas tour with Wild Cow Sonny on guitar! Luxemburg, It was a blast! We had great time in Luxemburg on Americana Rockabilly Delux Festival. Great crowd, thank you! Also this time on doublebass was Bart Crauwels! 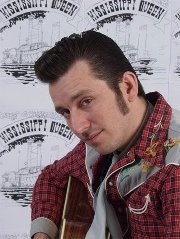 Interview for East Coast Rockabilly Central! 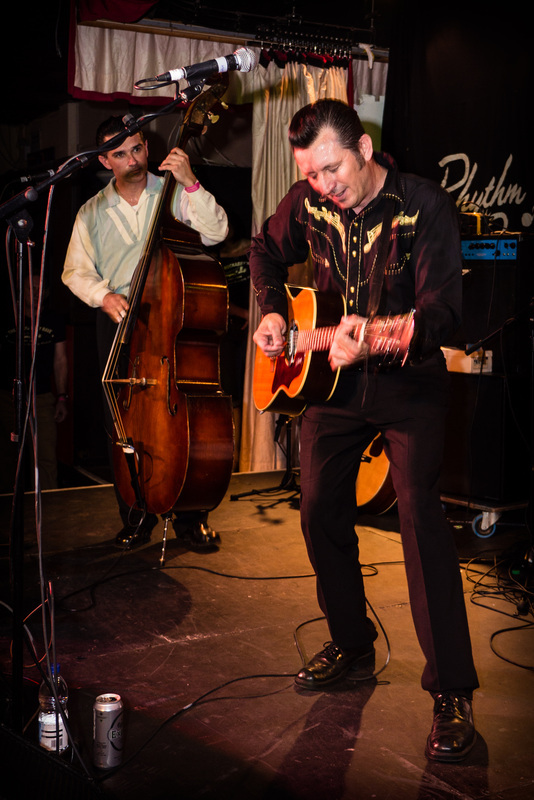 Here it is, Jurica Stelma "Slappinjoy" interview for one of most popular USA rockabilly website "East Coast Rockabilly Central". Here is link for interview where you can read something more about Mississippi Queen and about some future plans. Some stuff from The Rockabilly Rave #18! It was a blast at Rockabilly Rave. We had great time, great crowd. Thank you! 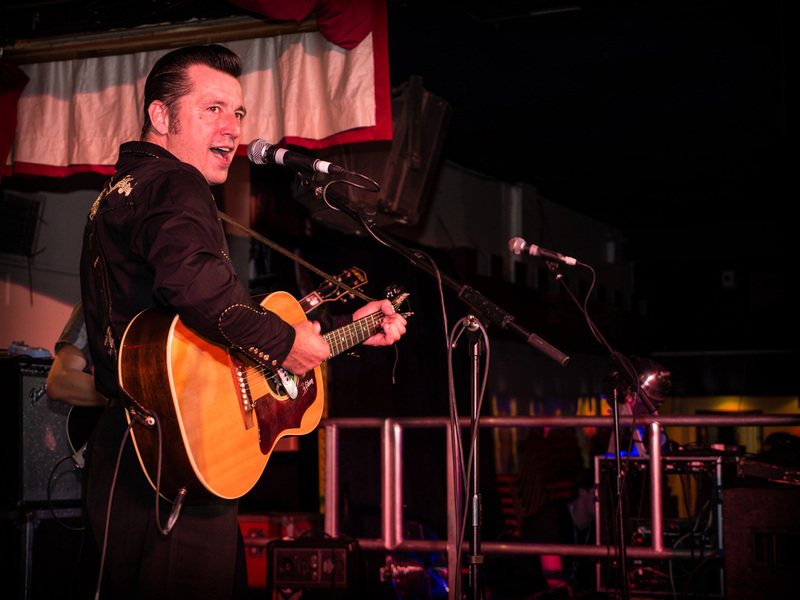 For more pictures and clips from The Rockabilly Rave visit our Facebook Fan Page! Cheers! June in Germany and UK! 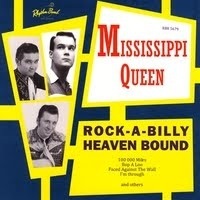 Rockabilly Heaven with Mississippi Queen! Don Karlos and The Preachers! Don Karlos and The Preachers - Zagreb, 19.02.'14. We'll play those gigs as drumless trio with Axel on guitar! It was great night in Caffe Bar Nad Urom, great crowd! Thank you guys, we really enjoyed. Java Bar, Oroslavje(CRO) --> 01.02.'14. It was a blast on X - Mas Riot and Route 66 too, great crowd! We would like to thank all of you for supporting us through 2013., we played many gigs this year so we'd like to thank promoters, club owners and we wish you a rockin' 2014! It was great last time in Konoba Lido Crikvenica, great crowd! Thank you guys, we really enjoyed. Just want to remind you on our gig in Crikvenica. If you are ready to shake your hips and if you like the sound of 50`, country, rockabilly, hillybilly you must come to make that night more special with your presence. It was great in CQ Bar! It was great night in CQ Bar, great crowd! Thank you guys, we really enjoyed. On 11.10 croatian rockabilly band Mississippi Queen play on island Krk(Croatia) and day after they play in CQ Bar(Switzerland). If you like the sound of 50`, country, rockabilly, hillybilly you must come to make that night more special with your presence. Don Karlos & The Tennessee Two - Zagreb, 18.09.13'. 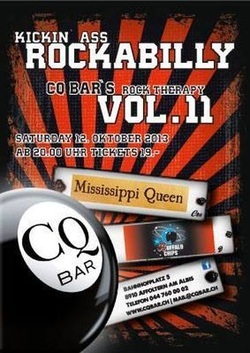 CQ Bar, 12.10. '13 - Affoltern am Albis, Swiss! X - Mas Riot, 14.12. '13, Wien! "Rave On-Party" was rockin' great! It was great night on Rave on Party, great crowd! Thank you guys, we really enjoyed. After short break, we charge our batterys and ready to make this place boppin'! First we want to send greets to all promotors, club owners, rockin' friends and other who support us on tour and make it great. It was a blast, rockin' and boppin! We are glad to meet all of you guys and hope to see you somewhere on stage soon! 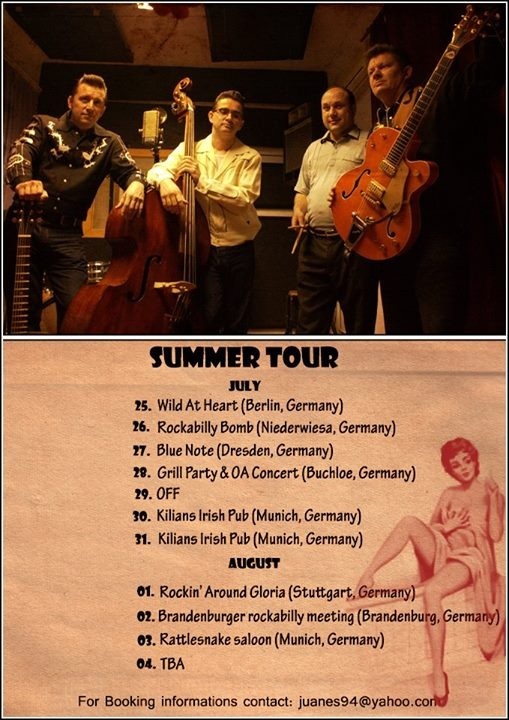 Mississippi Queen rockabilly "Summer Tour '13"
Thanks to all the slovenian friends in Bohinj at the American car meeting, for the great barbeque, beer(Laško, our favorit! ),and being a great crowd! Summer Overdrive '13 - 29th June, Bohinj! U.S. 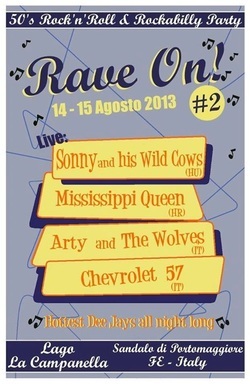 Car meeting and Rock'n'roll Party!! Don Karlos interview for "Rockabilly Online"
Here it is, Don Karlos interview for one of most popular rockabilly website "Rockabilly Online". Here is link for interview where you can read something more about Mississippi Queen and about some future plans. 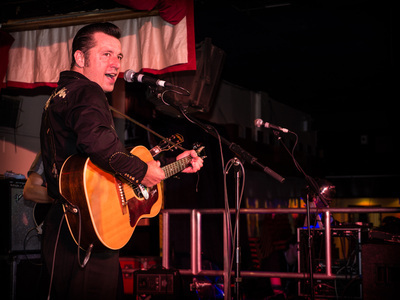 Nasty Rockabilly Weekend - 21st April '13. We must say: it was a really great night at Nasty Saloon/Treviso, thanks to great crowd, surprise session with Johnny Red, and "big man" Diego, owner of the bar, and his hospitallity. Thank you all, hope to see you soon somewhere on stage! Don Karlos interview for "Cruising Sweden"
Here it is interview of Don Karlos for most popular Sweden rockabilly website Cruising Sweden. You could read it directly from Cruising Sweden website of from our "Reviews/Interviews" section. 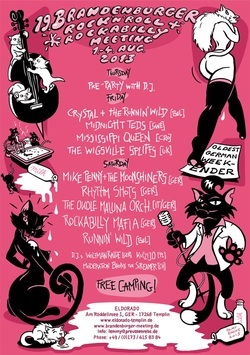 Nasty Rockabilly Weekend - 21.04.'13. 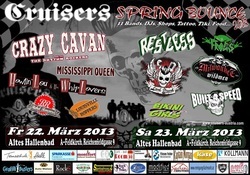 Cruiser Spring Bounce '13 ! March 22th, Cruisers Spring Bounce! One of destination that will rock your knees, and that might damage your brain functions , or what's left of them anyway. Be prepared!!! Buster review for "Rockabilly Heaven Bound"
"Rockabilly Heaven Bound" is album which was recorded in 2008. Buster Fayte, author of Rockabilly Romp blog was made review and you can see it direct from his blog, or on "review/interview" section. 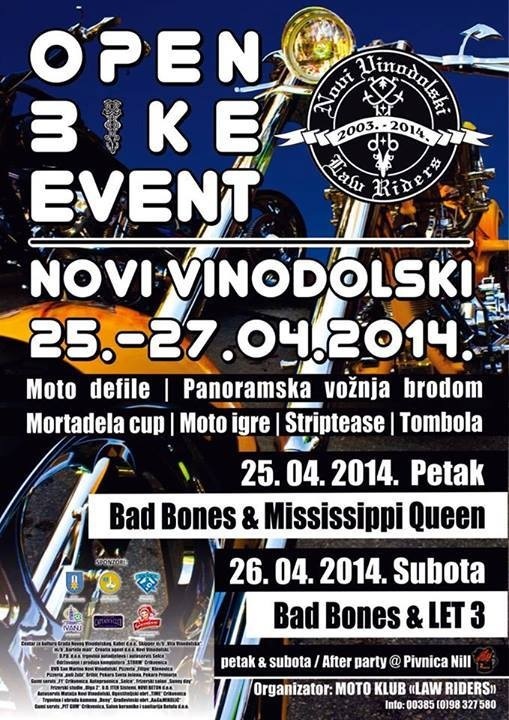 We are playing on second masquerade party organised by Sun Riders MC in Svirće, club Kokošara on Croatian island Hvar. Brand new song - Oh Yeah !!! 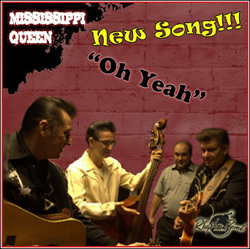 Here it is, after five years, a brend new Mississippi Queen tune "Oh Yeah"!!! And here it is. Like we promised for those cat's who didn't catch us live on Road Dog's Radio here is podcast of Sunday Morning Hanogver show, interview with Karlo Starčević aka Don Karlos. Interview for Road Dog's Radio! On Sunday(20.02) morning, we are hanging on with our friends from Road Dog's Radio. Karlo Starčević aka Don Karlos are making the interview for Sunday Morning Hangover show. So stay tuned and catch that interview if you have the time. Also expect that podcast here and on FB Fan Page. 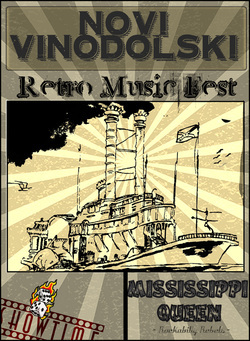 !Rockabilly music floats to you! Here is video from our gig in Route 66, Zagreb(Croatia). It's low quality but high atmphosfere. For next gig, check this site, it would be soon! New round of Balkan rockabilly revival! 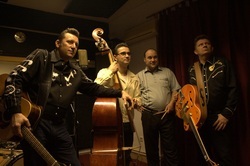 Our friends from Belgrad, Serbia start their own rockabilly radio. Radio is now in test phase but more to come. 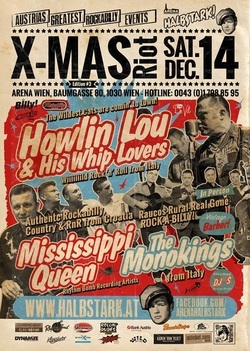 It would be great place for hanging on with Balkan rockabilly crew. Give them support. Also here is our song from Rock-a-Billy Heaven Bound album. One story about restless life! 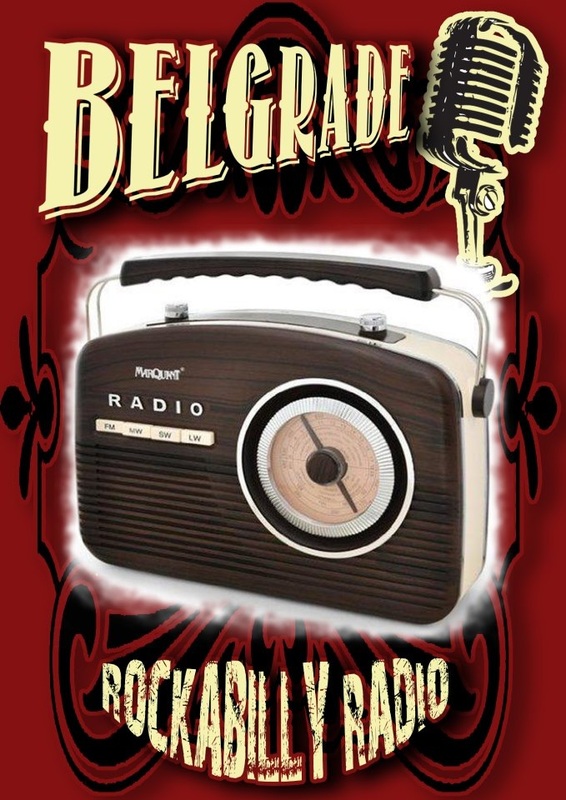 Belgrade rockabilly radio - Official site! Rockin' Christmas and Rollin' New Year! 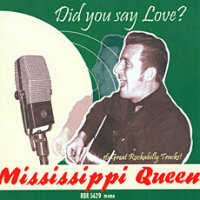 Mississippi Queen prepare summer tour in 2013. Till now booked dates are 19/20.07 for Roadrebel Festival in Augsburg and 02.08 for Brandenburg Meeting. If you want to see Mississippi Queen in your club, venue, or festival send message on juanes94@yahoo.com . Avaliable dates are between those two festivals. Next destination is Route 66. Be there and go rockin' with us. That was really special night, and it was honour for us. Interview sa Don Karlosom, frontmenom benda! Donosimo vam interview sa frontmenom benda Karlom Starčevićem alias Don Karlosom. U interview-u možete saznati sve, od osnivanja Mississippi Queen-a do osvrta na ovogodišnji peti po redu rockabilly festival Tear it Up!. Cijeli interview pročitajte u rubrici Reviews/Interviews ili klikom na ovaj link. This video is from Rattlesnake Saloon in Berlin 2009. Buddy Holly cover of his Blue Days, Black Night. For more videos from this gig visit this youtube chanell. Lovers of music from the 1950's will get a chance to rock 'n' roll at the Retro Music Festval, which will be held in the Adriatic coastal town of Novi Vinodolski from 29 June to 1 July. The three day festival is part of the 'New Music City 2012' project and will feature performances by international DJ's and local and international musicians. The main program will be held in the towns main square, and the organisers have announced that a 'world-known' name will perform. Besides the music program, there will be an exhibition of old timers, and retro fashion shows. Remind on Tear it Up! Tear it up! 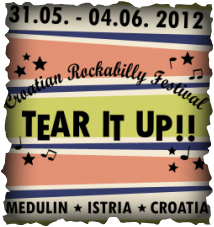 is the first rockabilly festival on the beautiful coast of Croatia. This will be our 5th edition and let us say that we're very excited about this, we're so much looking forward to the good times and good music! The festival is free during day for all visitors, so don't hesitate and make room in your calendar for this rockin' event with Mississippi Queen. And here is a review of festival on croatian --> follow link. First we are ready to shake Crikvenica, Konoba Lido - 05.05.2012. 21h, after that we go in Pula 19.05.2012. on Harley Davidson Party which is organised by Twin Horn MC Croatia. Golden Years is our first album which was recorded in 1993 and it's all filled with covers except one song. We hipe that you'll enjoy in this album and our outlawbilly sound. You can see review on our review/interview page. This is "Singin' the blues" from our preformance on TV. PS: If you want to buy this CD contact us on email. Dedication to Roy Orbison. His demo recording finished and recorded on our "Rockabilly Heaven Bound" album for Rhythm Bomb Records. Just want to remind you on our gigs in Pula and Crikvenica. 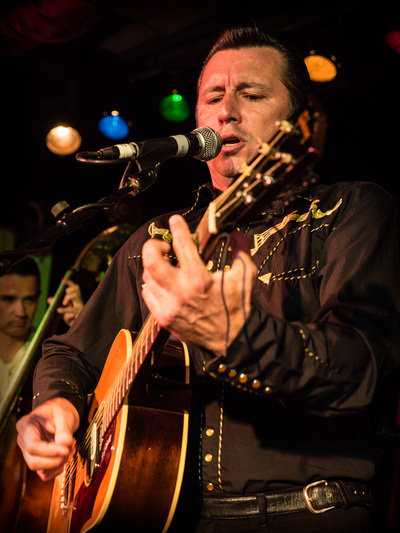 If you ready to shake your hips and if you like the sound of 50`, country, rockabilly, hillybilly you must come to make that night more special with your presence. Just keep to rock and roll, after Pula we are ready to shake Crikvenica. So put on some grease and let`s go rockin'. Time machine with Mississippi Queen. 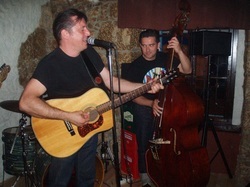 If you want to get some wild 50's jive than join us in Rock Caffe (Pula, Croatia) 06.04. at 21h. Here is one and only Mississippi Queen album on Croatian language, never realised for free download. Download link below. Donosimo vam album koji tek sada, 15 godina nakon što je snimljen, gleda svjetlost dana. Jedini album na hrvatskom jeziku koji zbog raznih razloga nije izdan, a evo kako je izgledala tadašnja postava Mississippi Queena. Ovdje možete poslušati naslovnu pjesmu albuma - Uzalud. Za par dana možete očekivati ovdje na našem web portalu nikad objavljeni album koji je sniman 1999. godine, ali zbog određenih razloga nikad nije realiziran. Tako da navratite na stranicu i skinite besplatno jedini album s pjesmama na hrvatskom jeziku. 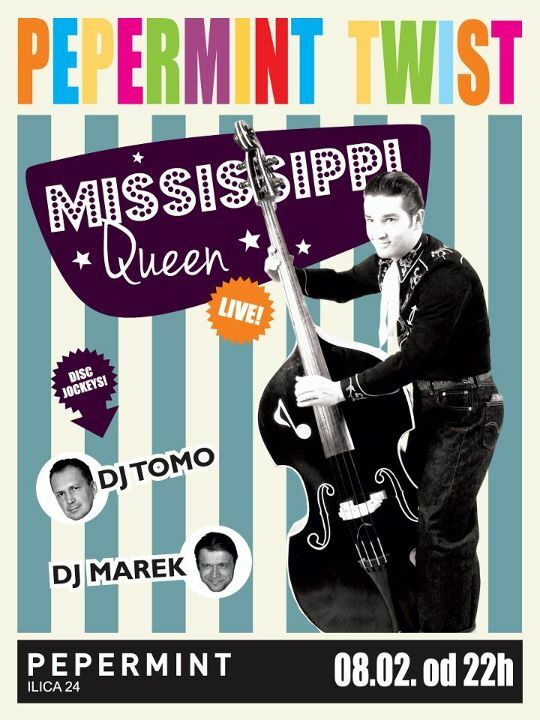 This wednesday 08.02 in Pepermint Club at 10:00pm Mississippi Queen starts to play. If you like the sound of 50`, country, rockabilly, hillybilly you must come to make that night more special with your presence. This is a song from never realeased album called "Uzalud", and this song is aboug girl which name is Tanja. Donosimo vam još jednu pjesmu sa nikad objavljenog albuma "Uzalud", a ovo je pjesma o djevojci po imenu Tanja. 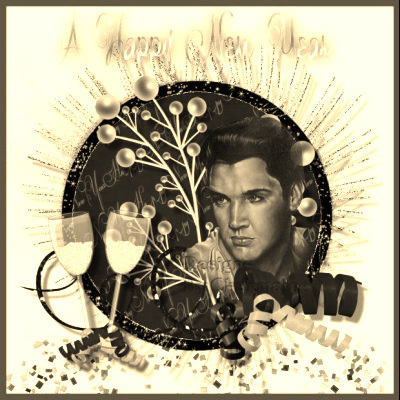 Video `s section is update with two new videos(songs) of Mississippi Queen. Video sekcija na portalu je osvježena sa dva nova videa odnososno dvije nove pjesme. Nadamo se da će vam se svidjeti. 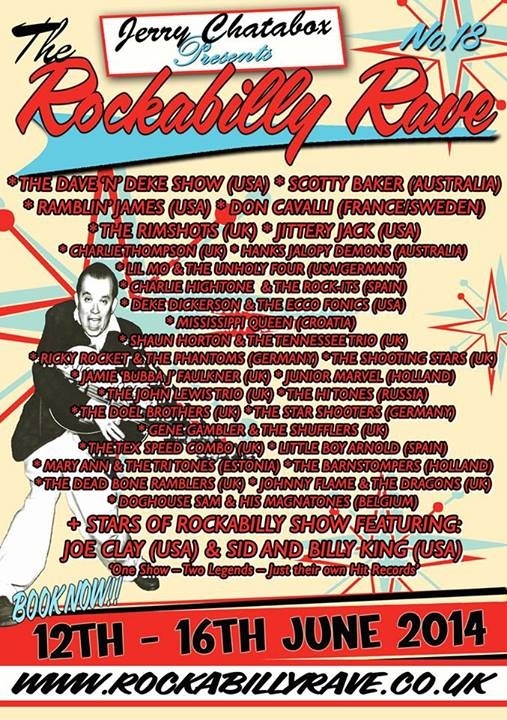 Review for "Rockabilly Heaven Bound"
_"Rockabilly Heaven Bound" is album which was recorded in 2008. Magazin Rootsville from Belgium was made review and you can see it on this page in english and croatian version. 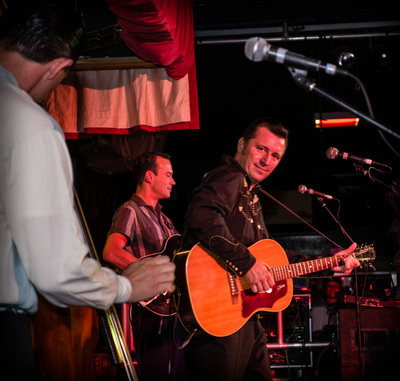 "Rockabilly Heaven Bound" album je izdan 2008. godine. Magazin Rootsville iz Belgije napravio je recenziju koju možete vidjeti na našoj stranici (more-reviews) u engleskoj i hrvatskoj verziji. 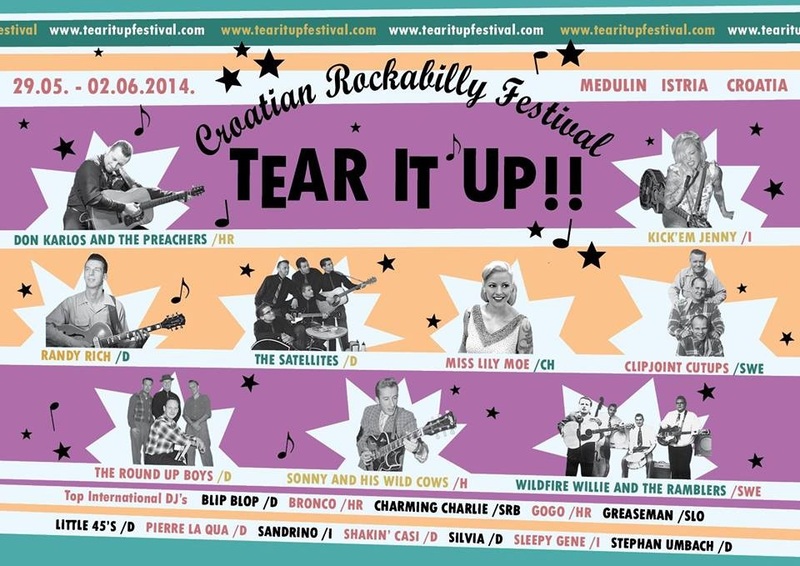 Peti po redu rockabilly festival u Medulinu jedini je takve vrste u Hrvatskoj. Ove godine održava se od 31.05. - 04.06. , a karakterističan je i po free upadu. Za vrijeme festivala zabavljat će vas više svijetskih i domačih bendova i disk jockey-a među kojima je i Mississippi Queen. 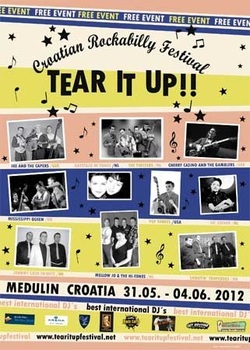 Stoga dođite i zabavite se na petom po redu rockabilly festivalu u Medulinu. Više informacija o festivalu i smještaju možete nači na Tear It Up službenoj stranici. Tear it up!! 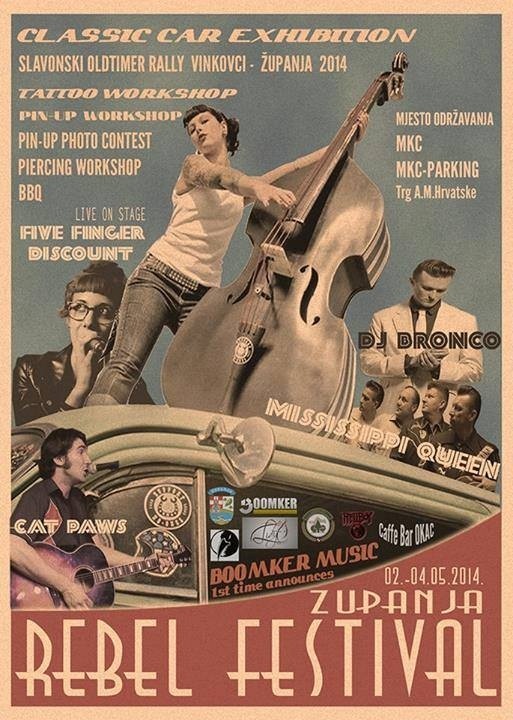 is the first rockabilly festival on the beautiful coast of Croatia. This will be our 5th edition and let us say that we're very excited about this, we're so much looking forward to the good times and good music! The festival is free during day for all visitors, so don't hesitate and make room in your calendar for this rockin' event with Mississippi Queen. 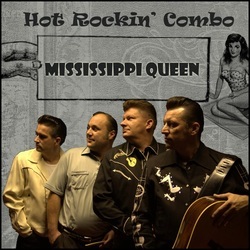 Kao što sam naslov kaže donosimo vam još jednu nikad objavljenu pjesmu rockabilly grupe Mississippi Queen pod naslovom "Could it be". Pjesma je snimljena krajem 90-tih i do sada nije bila objaljena ni na jednom studijskom albumu ove grupe. As the title says, we bring you another never released song of Mississippi Queen called "Could It Be". This song was recorded in the late '90s. Još jedna pjesma od Mississippi Queena na hrvatskom jeziku u country stilu. U orginalu pjeva M. Haggard "Drink Up and be somebody". Drink Up and be somebody is another song preformed by Mississippi Queen on Croatian language. Na današnji dan 8. sječnja 1935. godine rođen je američki pjevač Elvis Aaron Presley, ikona muzičke scene. Čovijek koji je još za vrijeme svog života postao legenda i kralj rock’n’rolla. Karijeru je započeo tako što je snimio pjesmu za svoji mamu pod nazivom "That`s all right". 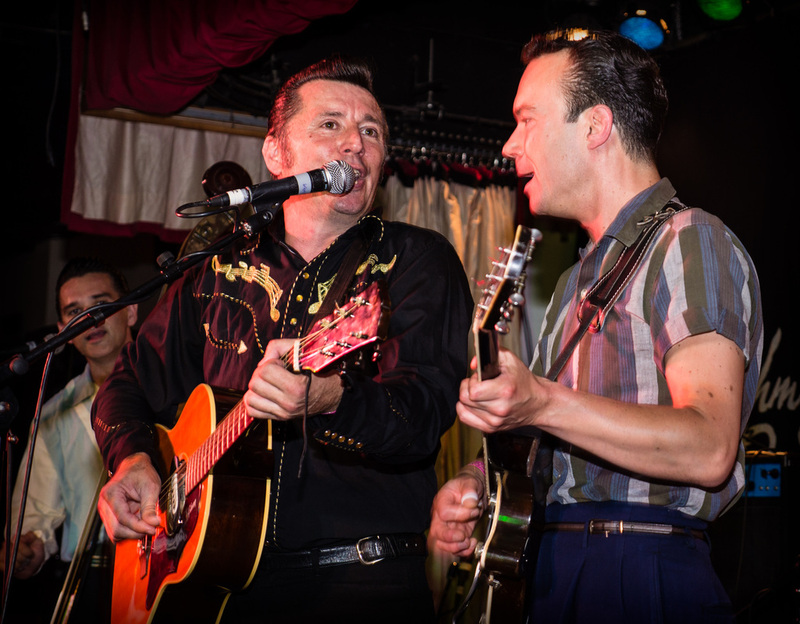 Početci njegove karijere bili su vezani za rockabilly i njegov jedini pravi album tog žarna "Sun Sessions". Za vrijeme 60-tih godina prošlog stolječa bavio je se glumom što mu i nije baš pošlo za rukom, tako da doživljava pad kako moralni tako i financijski jer neke filmove europsko tržište nije željelo ni otkupiti. Krajem 60-tih događa se veliki "comeback" Elvisa te postaje "The King". Elvise Presley preminuo je 16. kolovoza 1977. godine, a posljednji koncert održao je u Indianapolisu. Kako na ovim prostorima predstaviti jednu pravu rockabilly grupu? Kako nekome ko je možda nekada davno čuo za pojam rockabilly, staviti do znanja da i kod nas (kada kažem kod nas, mislim na Balkan) ima rockabilly grupa, ima rockabilly sljedbenika. "Oprosti mu" je jedna od rijetkih pjesama grupe Mississippi Queen koja je pisana na hrvatskom jeziku. 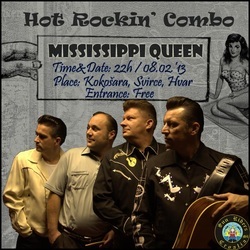 "Forgive him" is one of the few songs by Mississippi Queen performed on Croatian language. Review for "Did you say Love"
"Did you say love" is album which was recorded in 2005. 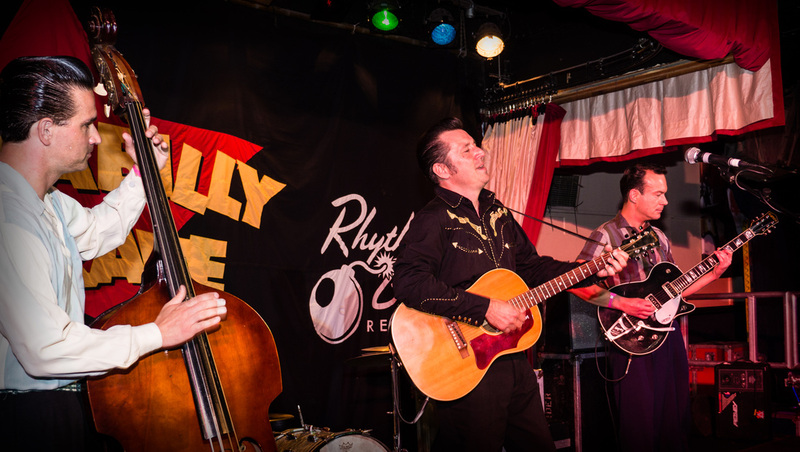 Site rockabilly.nl was made review and you can see it on this page in english and croatian version. "Did you say love" album je izdan 2005. godine. Portal rockabilly.nl napravio je recenziju koju možete vidjeti na našoj stranici (more-reviews) u engleskoj i hrvatskoj verziji. _Kao sto vidite portal za fanove rockabilly grupe Mississippi Queen je i službeno otvoren. Ovdje možete pitati za sve vezano uz rad grupe, informirati se o nastupima te poslušati neke pjesme i pogledati fotografije sa prijašnjih koncerata. Uživajte.